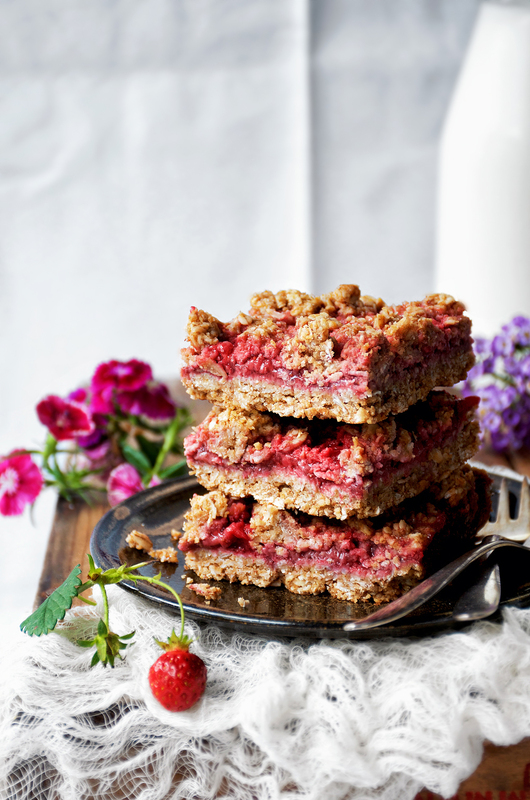 Vegan and gluten free strawberry crumble bars with an oat base and streusel, lots of seasonal berries, and a little coconut sugar for sweetness. These bars are great for an on the run breakfast or snack, and equally good served with ice cream as a healthier dessert. I had plans to go pick strawberries one last time this past weekend with a friend. The weather didn’t agree. We had a crazy storm last week, with just about all of southwestern Manitoba getting significant amounts of hail. There was about an hour of continuous hail at my house (which I’ve never experienced before). So the strawberries were hailed on, along with just about every other crop around here, and they decided to close a little earlier than they might have otherwise. 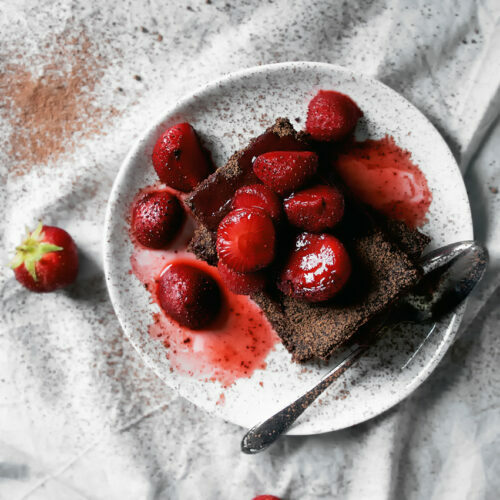 There was still a place advertising for you-pick a little further north, though, so I think this recipe just fits in to the tail end of strawberry season. That being said, if you can’t find any, this recipe would work wonderfully with any type of berry. My sister stopped by at just the right time for me to coerce her into hand modelling (she was bribed with one of the bars). Graham and I went camping earlier this week in a nearby national park. If you ever come to Manitoba, go to Riding Mountain. It’s so beautiful, and it’s one of the larger easily accessible parks in Canada. It’s a pretty big tourist attraction, and busy on the weekends, but there are still plenty of wild animals and plants. We saw four black bears, a couple muskrats, the tiniest bunny, a few squirrels, and a groundhog this time. And deer, always deer. No moose on this trip but I have seen them up there before, and a friend saw a lynx today, too. I always forget how small black bears are. This time of year is perfect because there are plenty of wild berries and the bears aren’t as dangerous, ha. I took a bit of a break from social media while we were there and it was a nice little holiday. I did a test run for Kristina’s wedding cake yesterday, which was definitely not healthy or plant based. I had a piece and I’m so itchy now. My hands are just driving me bonkers here trying to type. 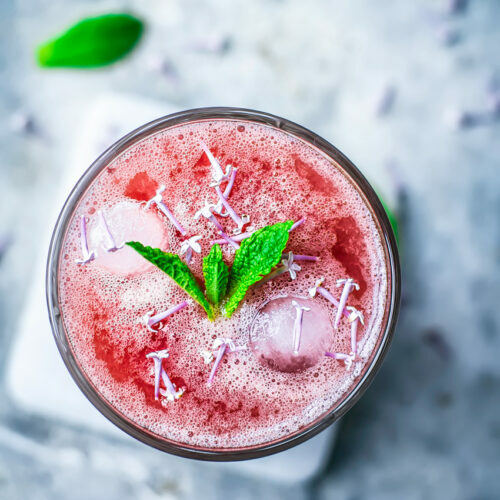 If you hadn’t noticed, I haven’t posted a recipe with dairy in it for a long time, and it’s because I figured out that it was the culprit for a pile of skin and digestive issues. The cake turned out well though, and she and her fiancé both really liked it. Thanks to my pal Traci from Vanilla and Bean for her wonderful advice on buttercream types and general pastry tips! It’s been too long since I baked sugary, buttery pastry and I was a bit rusty. It was fun making the cake and not having to be a kitchen chemist for the day, trying to figure out how to replace standard baking ingredients and techniques, but I don’t miss it. It’s not as interesting as testing healthy recipes. 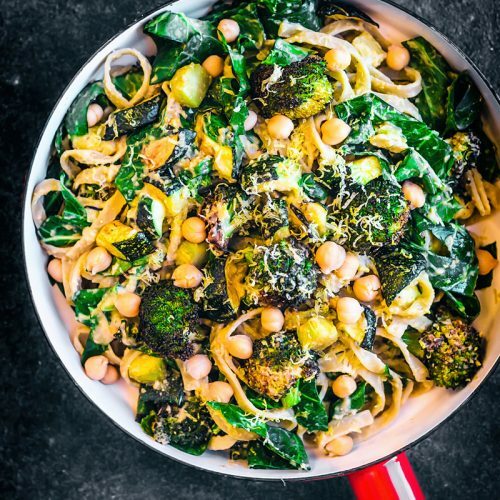 And, with healthy recipes, I don’t end up with more eczema than hands! Win-win, right? 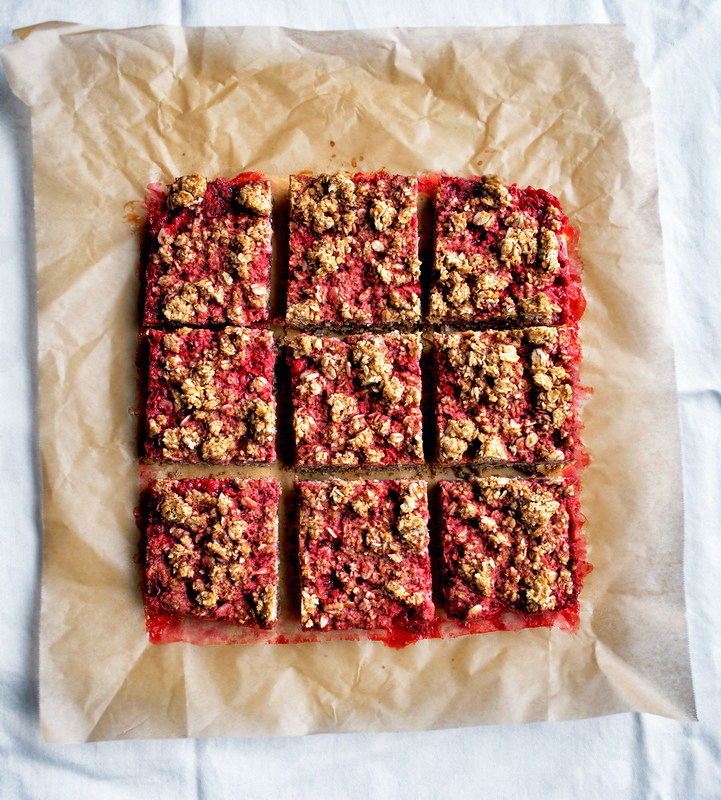 These vegan strawberry crumble bars are loosely adapted from my date squares (bad pictures but so delicious), with almond butter acting as the binder instead of flax to make a PB&J twist. 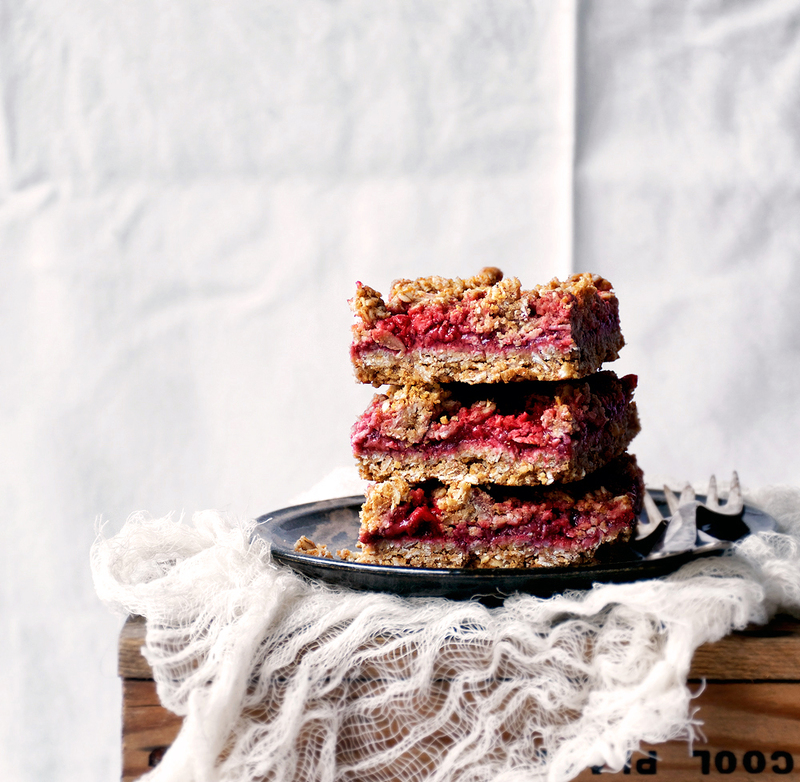 The bars are very lightly sweetened and full of healthy oats so if you feel like having one for breakfast, you go for it. I recommend using ripe seasonal berries for the filling, or excellent frozen berries, as you’ll really need their natural sweetness and stronger flavour compared to out of season fruit. The base and topping are crunchy, a little bit rich, and naturally gluten free thanks to rolled oats and oat flour. Good bye, strawberries. See you next year. 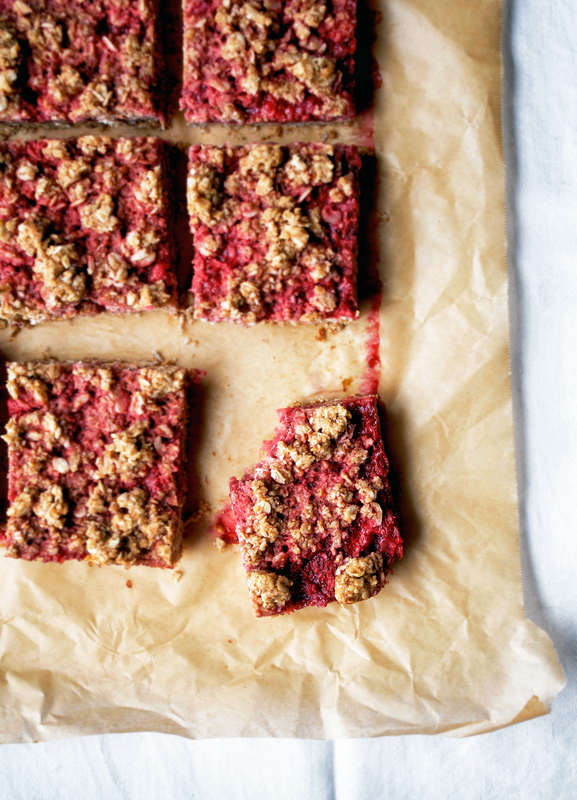 Vegan and gluten free strawberry crumble bars with an oat base and streusel, lots of seasonal berries, and a little coconut sugar for sweetness. Preheat the oven to 350F/180C and line a square (8x8 inch) baking pan with parchment paper. In a large bowl, combine the oat flour and oats, coconut sugar, and salt. Add the coconut oil, almond butter, and vanilla and stir until everything has been incorporated and it holds together when pressed. Reserve one cup of this mixture for the topping. Evenly crumble the remaining oat mixture into the prepared baking pan, and press firmly with your hands to make the base. You can use a small rolling pin or wet hands to make an even layer. Add the strawberry mixture and spread it over the base layer. 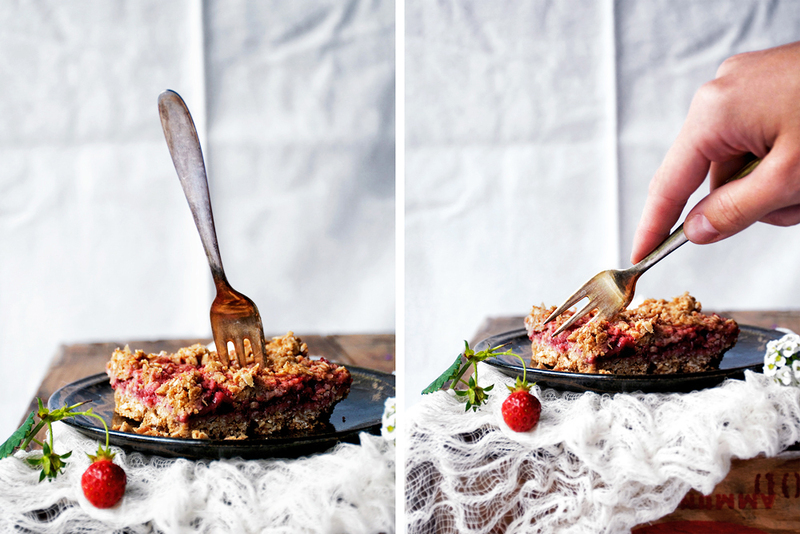 Crumble the reserved one cup of oat mixture over the strawberry filling. Bake at 350F/180C for 35-40 minutes, or until golden. Place the strawberries in a shallow bowl (you might have to do this in two batches) and mash them with a fork. It doesn't need to be perfectly smooth. Stir in the arrowroot, lemon juice, and maple syrup (if using). It will thicken as it bakes and turn into jam. * You can substitute a scant 2 cups of store-bought oat flour for homemade. 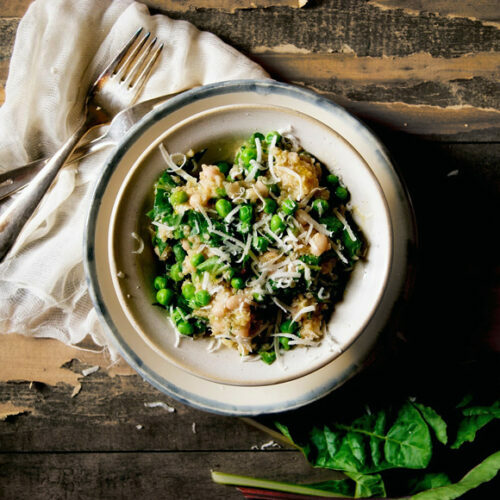 To make your own, blend the oats in a food processor for a minute or two until a flour forms. ** Cornstarch can be substituted for arrowroot if you can't find any. Arrowroot powder is my preference because it's not as heavily sprayed as corn. 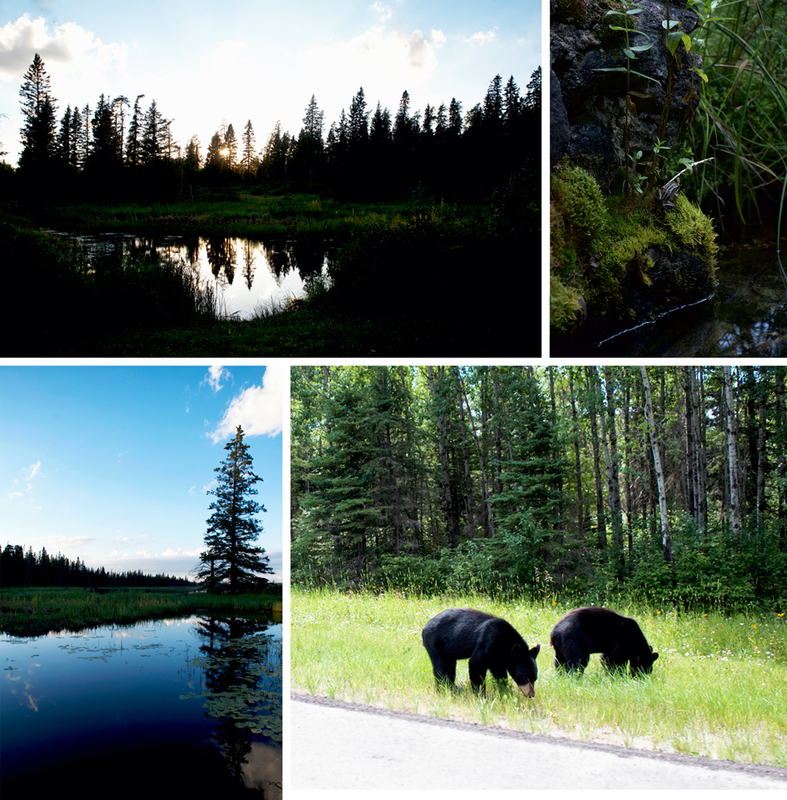 Riding Mountain looks GORGEOUS – if I am ever in Manitoba again, I know where to go! 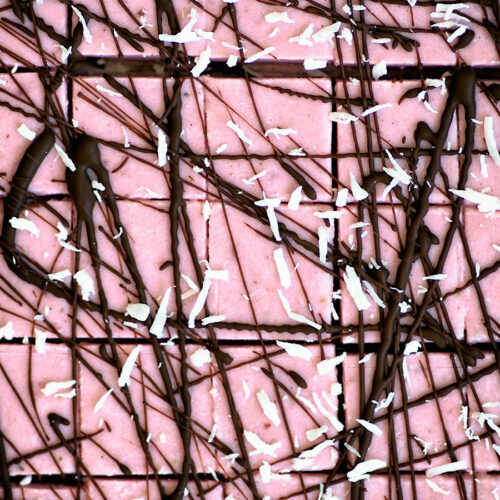 These Strawberry Jam Bars sound so delicious…love that they are sweetened with just coconut sugar and maple syrup! I hope you can visit at some point, it's a beautiful area! It's perhaps my favourite place in Manitoba. Thanks, Koko! Gorgeous photos! 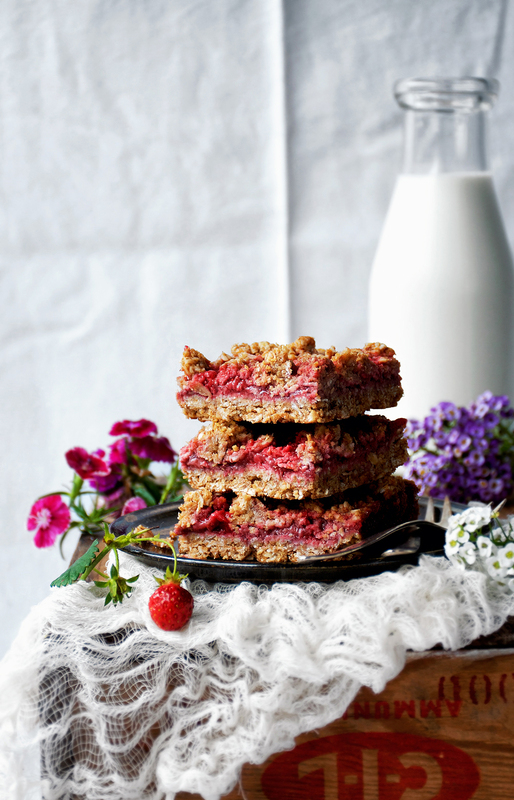 The strawberry jam bars look great – love the use of arrowroot – it's just so versatile. Thank you! Arrowroot is one of my favourites in plant based baking.